In the previous tutorials, we learned basics of DBMS. In this guide, we will see the DBMS architecture. Database management systems architecture will help us understand the components of database system and the relation among them. 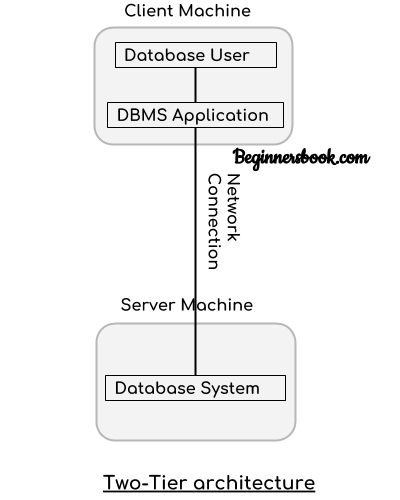 The architecture of DBMS depends on the computer system on which it runs. For example, in a client-server DBMS architecture, the database systems at server machine can run several requests made by client machine. We will understand this communication with the help of diagrams. In this type of architecture, the database is readily available on the client machine, any request made by client doesn’t require a network connection to perform the action on the database. For example, lets say you want to fetch the records of employee from the database and the database is available on your computer system, so the request to fetch employee details will be done by your computer and the records will be fetched from the database by your computer as well. This type of system is generally referred as local database system. 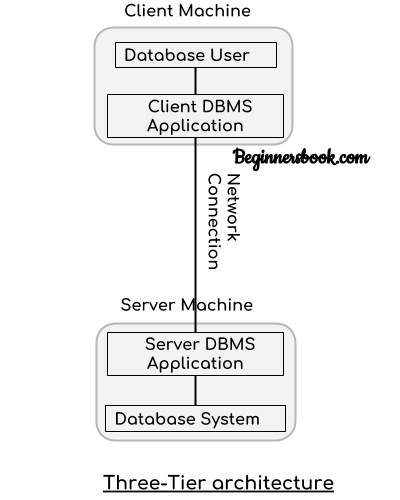 In two-tier architecture, the Database system is present at the server machine and the DBMS application is present at the client machine, these two machines are connected with each other through a reliable network as shown in the above diagram. Whenever client machine makes a request to access the database present at server using a query language like sql, the server perform the request on the database and returns the result back to the client. The application connection interface such as JDBC, ODBC are used for the interaction between server and client. In three-tier architecture, another layer is present between the client machine and server machine. In this architecture, the client application doesn’t communicate directly with the database systems present at the server machine, rather the client application communicates with server application and the server application internally communicates with the database system present at the server.